Ludington hosts the annual craft beer tasting festival, aptly named Suds on the Shore from 1pm-7pm at Rotary Park (formerly City Park), Gaylord and Court Streets. This popular event, scheduled in mid-August, is fun for participants and a fundraising effort for the United Way of Mason County. The 2019 Suds on the Shore is scheduled for Saturday, August 17th. The festival features vendors from all around Michigan, with over 50 represented in 2018...providing over 100 samples of craft beer, hard cider and Michigan wine, live music and food. In 2018, between 2,800-3,000 people attended Suds on the Shore. Tickets are generally $25 in advance ($35 at the gate) and can be purchased online at Sudsontheshore.com You can also buy your ticket at Jamesport Brewing Company, Pere Marquette Expeditions, The Mitten Bar and Surroundngs in Manistee. Your ticket includes entry, eight tokens and a souvenir glass. Each token gets you 4oz. of beer or 2oz. of wine. Eight additional tokens can be purchased for $5. This event is only for those 21 and older. Ludington is getting in on the act. In January of 2015, they launched the first Pure Ludington Brrrewfest, which brought in 20 brewers from all over Michigan. Come experience the goodness of home-brewed beer and help raise money for United Way, at the Suds on the Shore Festival. 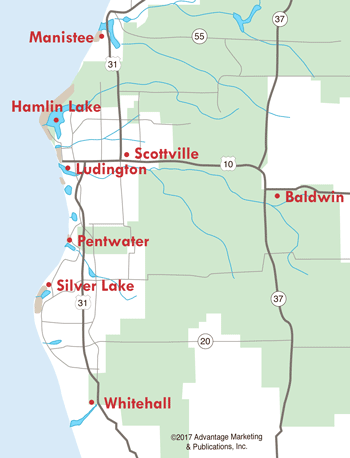 Check out Ludington Lodging for places to stay during Suds on the Shore and Ludington Restaurants for great places to eat.